Trefik contains an algorithm for creating predictions for matches. The Trefík user (= you) can influence the results of this algorithm by modifying its parameters. It is also possible to set different parameters for determining the tip for each sport or competition. Before Trefík creates any prediction the team's strength is counted first. The team strength can be increased - if the team was successful or reduced - if the team was not successful in the previous match. However, the scale of success is not always unambiguous. It is obviously something else to defeat as the leader of the table by a single goal in the second team of the table or by the same difference to defeat the last team of the table. The calculation of the team strength takes this into account. In the algorithm parameters, it is possible to determine how the strength of the two teams changes after a given result. It is possible to define how many percent of the strength is deducted and added to the guests, and similarly, how many percent of the domestic team strength is deducted and how much is added to the guests. This setting can be made for a given score difference. 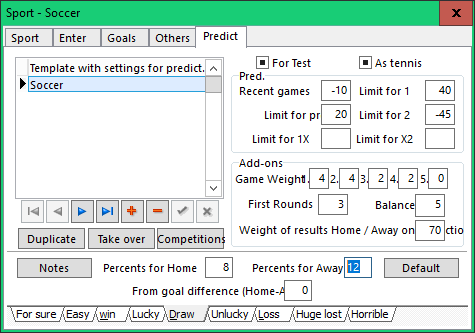 The picture shows settings for a draw result (which corresponds to the score difference of 0). The house is added to 8 percent of the guest (to which is deducted the same) and adds 12 percent of the home (and the same is deducted to the home team). 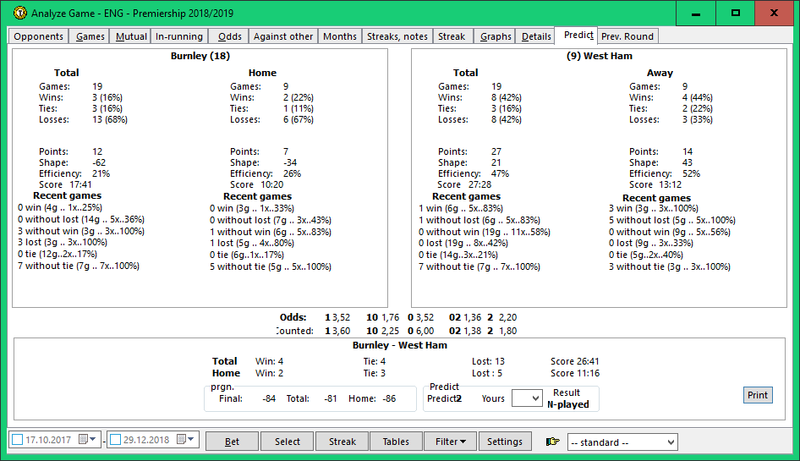 It takes into account the strength of the team before the match and it may happen that the home draw improves and the guest strength gets worse (even though the percentage ratio is set to 8:12). It depends on the strength of both teams before the match. Counted team strength is used by Trefík to set the match prognosis value. 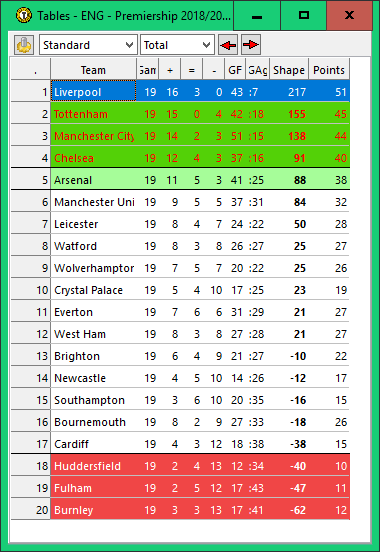 The prognosis is the difference between the more team and the guest team strength (counted twice: once for all matches, then only for home / away matches; the total prognosis is based on two counted prognosis total and home/away). As the parameters for predicting each sport are set the predictions are created based on the prognosis value.